A swift wing flashing between sea and sky. Though somehow glimmering on each horizon. Lovely poem, and a great story to go with it. What a lovely story! Thank you. My words exactly! What a lovely story! How mystical…I hope we all listen to what’s calling us today and follow without our noses in a map…or an iPhone app! Blessings to you! Thank you Malcolm for your great posts and for sharing your poems with me. I don’t expect you will remember me but I came to St Edwards during the summer time whilst I was working at Corpus for the last three years. I also went along to the Gothic Eucharist’s a couple of times, and to Friday meditative prayer, all of which was so memorable. I was though greatly saddened to hear about the troubles facing Fraser. Anyway, I was licensed as a Reader/Lay Minister by Bishop Wyn in St David’s cathedral last October and am really enjoying my ministry so far. I am doing the dip Theo through The Church in Wales and as prospective ordinands we get the Church Times free. I had such a nice surprise to see you on the front cover this week and have been showing you off to everyone I know here in Carmarthenshire! I used your sonnet for Pentecost at the opening of a Saturday school for ministry skills last Saturday (and plugged your book), and also used it to end my sermon at Evensong last night, and it was much praised, so thank you for the resource it’s so nice to have something so fresh and creative in amongst all the other things we do and say. Thanks Caroline. Yes I remember you – good to hear from you again! Thank you for this moving sonnet, Mal-Colm. My name is Lainie, and I live in the States, but have both Irish and Scottish roots. St Columba has been a powerful mentor for me in the past 5 years when I first read about him and visited Iona. My husband and I have been on a similar path as Columba for many years … pilgrims called to minister away from our “homeland” of sorts. 2 years ago I took a longer pilgrimage to Iona through an immersion class at Perkins School of Theology in Dallas, TX. Again, Columba became my teacher. This sonnet speaks a depth to my heart. This still gives me chills. With both the story and the poem, you give a glimpse into that profound grace given when He calls us to understand the meaning of our name. Thank you. Thank you for sharing your story. 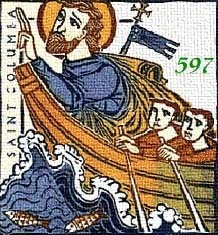 I feel a special connexion to Columba, too; he is my patron saint. It never fails to amaze and delight me the myriad ways God calls people to himself and to his work! Thank you for your amazing story followed by a beautiful poem. Glencolumkille is a very special, spiritual place. Thank you so much for sharing this. Beautiful story and poem! Lovely story Malcolm. 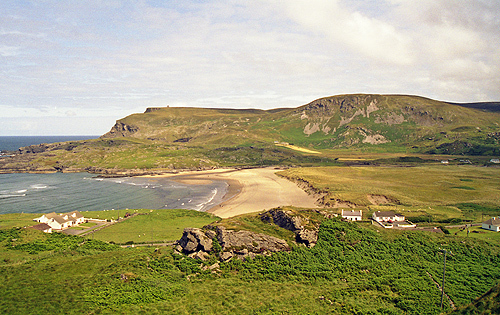 I raised my children in Glencolmcille and still relish the thought of going back with them one day to meet old friends. What a wonderful place to bring up children! Ah. My Grandmother Jeanetta Murray Published a cycle of poems called the Legendary of St Mungo which includes a beautiful account of the meeting of Columba and Mungo! Malcolm is it possible to post a snippet of this meeting? Malcolm, I was introduced to you by my friend Kendall Ruth (and I’m headed to KindlingsFest! ).